REU Students - petraditsches Webseite! REU students Christina Linkem (University of Hawaii at Manoa) and Lisa Truong (Wellesley College) were working closely together with me in a project on clingfish ecology. Northern Clingfish colonizes the rocky intertidal of the Pacific Northwest. It lives among the wave-swept boulders, using an adhesive suction disc to prevent being washed away. These little fish sticks so well that it can launch predatory attacks on the archetypal attached marine invertebrate – the limpet. The substrates in the rocky intertidal are challenging as they show various surface topographies, from nearly smooth to very rough. Our previous work shows that the surface roughness of the substrate has a significant effect on the adhesive force of Northern Clingfish. Actually, we found that the fish can stick even better to rough surfaces compared to smooth ones. They can attach up to very rough surface topographies, but the threshold roughness depends on the size of the fish. Moreover in aquatic environments solid substrates are fouled by bacteria, algae and invertebrates. This growth changes the elasticity and surface roughness of the primary substrate. We could already show that this growth changes the attachment strength of Northern Clingfish. All this previous work was done under controlled conditions in the laboratory. 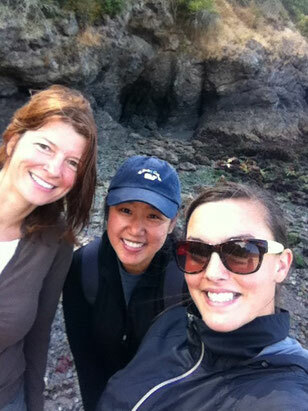 Lisa Truong and Christina Linkem investigating clingfish distribution, rock size and roughness at Reuben Tarte Beach. The aim of the study was to get more detailed information about the relevant environmental parameters of the natural habitat of Northern Clingfish and compare this with our previous knowledge. 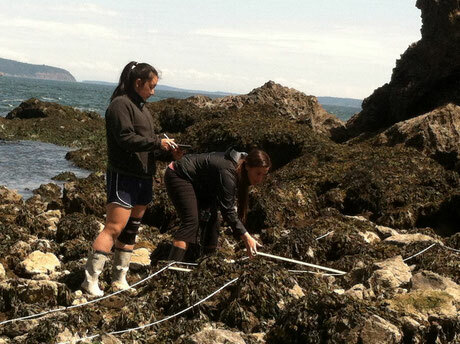 Therefore, we choose a well known Clingfish habitat on San Juan Island for intensive investigation. The environmental parameters, which we studied in detail for a transect, were surface roughness of the rocks, of fouling of the natural boulders, rock size, substrate composition and flow velocity. Lisa and Christina presented their results at SICB in West Palm Beach, 2015. A paper including the project results is in preparation.